Everyone who is everyone that claims to feign over fashion attests to loving Zara - that European clothing brand that hopped on over across the Atlantic with its faux suede pinafores and patent leather pleated skirts, quirky bags, and multifaceted capsule collections. The truth is, it’s a cheap, low quality production assembly line of clothing. At least I think so. My mom calls it the sister to H&M, a store we share a mutual hatred for. It’s doing a poor job of piggybacking off of my beloved - The United Colors of Benneton - which formed my conceptions of European lifestyle while growing up in the heart of New York City. It’s where my parents purchased the heftily priced 100% sheep wool forest green hooded, wooden barrow-button downed coats for me and the creamed fur hat I longed for as a way to emulate the Russian aristocracy. The hat was what I associated with the svelte Eastern European Olympic gymnasts that I saw on television. It’s where I purchased my first and only beret: So très chic. School would wear. It suited her and I had not known that she was donning Zara apparel until her boyfriend remarked how she would only buy expensive clothes, from Zara, when we we were reading about analogies made to the journalism business. I let the “expensive” misconception slide because I secretly fancied her boyfriend: handsome in the old Hollywood way except he was South Asian and bore a striking resemblance to the late actor, Shammi Kapoor. I was content knowing that he sat two seats over because the surnames of him, his girlfriend and I were juxtaposed alphabetically, but I digress. I cannot deny the therapeutic quality of purchasing a new addition to my wardrobe nor can I deny the prospect of having somewhere to wear it to. I cannot deny a good investment that also happens to be at a great price, and so I walked into Zara, picturing the handsome fellow grad school peer turned associate producer, approving of my decision with his trademark overbite smile. This daydream admittedly made me laugh in the girlish way of my high school days. I felt happy and let my preconceptions of the massive store go by the wayside. 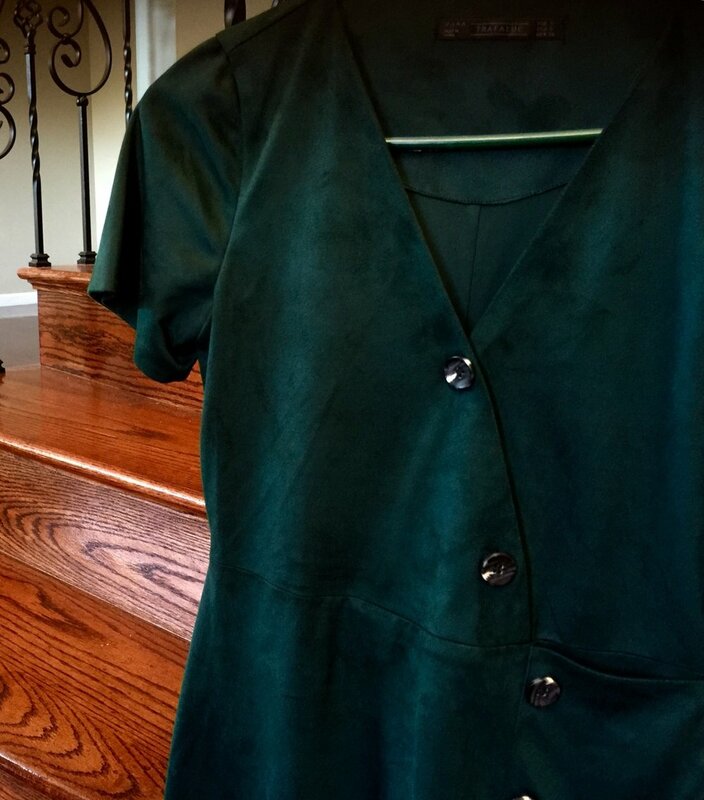 I picked up a bottle green minidress with an asymmetric neckline bordered by four large tortoise shell buttons. There was a nifty pocket on the left panel. The fabric was not suede but polyester, yet it looked otherwise. The last one left, I clasped the hanger and made a beeline to the fitting room. It looked just like me: unique, able to be worn for all seasons. I could wear it now, during the summer, as is because it was short-sleeve and above the knee, and the fabric was not too heavy. Yet the fabric was heavy enough to be worn in the fall with a light cardigan or jacket thrown over it and opaque tights with my distressed brown leather knee-high equestrian boots. I could wear this with sweater tights and a chunky buttoned down sweater and UGGs in the winter. The dress was more dressy than casual and seemed the perfect attire for a fashion conscious magazine journalist to wear in an office setting, should one exist. The deep green and spotted buttons would allow me to switch off between any of my three glasses frames that range from black to taupe to a ombré tan. This was an investment piece. And though the dress seemed all too perfect, the full-length mirror revealed what nothing else could. I was still too skinny. I still looked emaciated. There was nothing attractive about my stick figure. Visions of the dreamy video journalist evaporated. I flashed back to the weeks before my grad school graduation when he caught sight of me in the hallway. I saw a wave of shock contort his face while I tried to avoid his gaze, spinning on my heel and walking away in the opposite direction. I was not as bad as before, but I was nowhere near to what I was before this sickness ever befell me, or rather, before I ever did this to myself. I still needed to get my period. I still needed to have my thighs be closer in proximity to each other. I still needed my spine and shoulder blades to not jut out so much. I was determined to stuff my face later. The dress was slightly form-fitting on my gaunt frame and despite not filling it out, I know that as soon as I put on the healthy weight, this dress would no longer be an investment piece. I would refuse to wear it because I don’t like wearing curve hugging and constricting clothing. It would be what I called my “anorexic clothing.” That is, the disordered clothing that are staples in my wardrobe because I would strive to fit into then despite the fact that they were old and made for a much younger body. Perhaps I should keep the dress. It would do good for me - I could gain a good 15 pounds and still fit comfortably in the dress. And who knows, I could perhaps meet not that crush I had, but a true companion, a future husband. Ultimately, I have decided to return this dress. All because I know that the quality is poor. It’s parachute-like fabric does not reflect me. I opt for quality. I air on the side of aristocracy. I would rather purchase the classic and q quilted Chanel than the trending “NERD” engraved pleather clutch. Mirror, mirror on the wall. I’m regaining not only my body, but I’m regaining my self, my identity.